Tornadic thunderstorms do not require tropical-type warmth. In fact, tornadoes are almost unheard of in the tropics, despite frequent thunderstorm activity. An unusually warm Gulf of Mexico of 1 or 2 degrees right now cannot explain the increase in contrast between warm and cold air masses which is key for tornado formation because that slight warmth cannot compete with the 10 to 20 degree below-normal air in the Midwest and Ohio Valley which has not wanted to give way to spring yet. The “extra moisture” from the Gulf is not that important, because it’s almost always available this time of year…it’s the wind shear that caused this outbreak. More tornadoes due to “global warming”, if such a thing happened, would be more tornadoes in Canada, where they don’t usually occur. NOT in Alabama. Thus we yet again run into the logic of the marketing campaign to change the effect of CO2 from global warming to climate change, as if CO2 could somehow make for random climate changes without the intermediate step of warming. We all draw upon fallible memories to come to conclusions about whether events are more or less prevalent today, and in many cases our memories fail us (often due to observer bias, in particular the increasing frequency of an event in the media being mistaken for the increasing underlying frequency of the event). I will say that my memory is that the seventies were the time in my life with the most severe weather (including horrible regional famines) and the seventies were the coldest decade of my life so far. Whoa, that’s scary. Any moron can see there is a trend there. Its like a silver bullet against skeptics or something. But wait. Hasn’t tornado detection technology changed over the last 50 years? Today, we have doppler radar, so we can detect even smaller size 1 tornadoes, even if no one on the ground actually spots them (which happens fairly often). But how did they measure smaller tornadoes in 1955 if no one spotted them? Answer: They didn’t. In effect, this graph is measuring apples and oranges. It is measuring all the tornadoes we spotted by human eye in 1955 with all the tornadoes we spotted with doppler radar in 2000. The NOAA tries to make this problem clear on their web site. 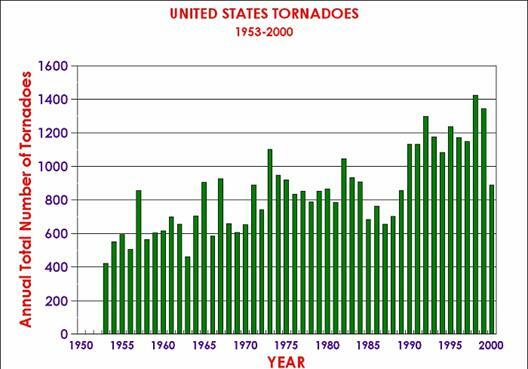 With increased national doppler radar coverage, increasing population, and greater attention to tornado reporting, there has been an increase in the number of tornado reports over the past several decades. This can create a misleading appearance of an increasing trend in tornado frequency. To better understand the true variability and trend in tornado frequency in the US, the total number of strong to violent tornadoes (F3 to F5 category on the Fujita scale) can be analyzed. These are the tornadoes that would have likely been reported even during the decades before Dopplar radar use became widespread and practices resulted in increasingtornado reports. 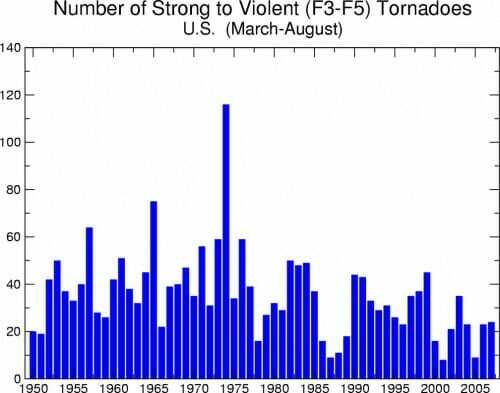 The bar chart below indicates there has been little trend in the strongest tornadoes over the past 55 years. So itt turns out there is a decent way to correct for this. We don’t think that folks in 1955 were missing many of the larger class 3-5 tornadoes, so comparing 1955 and 2000 data for these larger tornadoes should be more apples to apples (via NOAA). By the way, note the 2nd to last bar, which I believe it the 2008 bar (this chart is really hard to read, but it is the only way I have found the data from the NOAA). In spring of 2008, the media went nuts with a spring spate of tornadoes, saying that the apocalypse was here and this was the ultimate proof of global warming. In particular, ABC ran a story about how the frequency was twice the previous year. 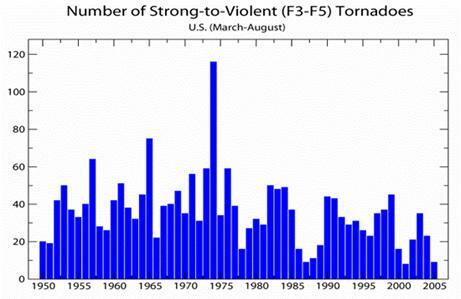 Beyond the insanity of drawing long term trends in a noisy system from 2 data points, notice that the previous year was virtually the lowest number in half a century, and despite being twice as high, 2008 turned out to be an average to lower-than-average tornado year. This is what the media does with the climate issue, and why you can trust almost none of it. Update: By the way, 10 of the top 10 deadliest tornadoes occurred before 1955? An artifact of increasing wealth, better construction, and in particular better warning and communication systems? Likely -- it is no accident, I think, these all occurred before the popularization of TV. However, remember this argument when you see charts of increasing property damage from hurricanes. These are also an artifact of increasing wealth, but the other way around -- more rich people build expensive houses on the beech, the more property damage from hurricanes irregardless of hurricane strength or frequency. Update#2: The entire outbreak may be the third deadliest in the century.